Chao Xiong (left) and Aliya Mohamed (right) enjoy giving back to their community by preserving the river. Tucked along the Mississippi riverfront just east of downtown St. Paul, Willowbrook natural area has been many things: a fish hatchery, a public park with a ski jump, even a zoo. Now, thanks to the students of the Harding High Earth Club, it's being restored to a healthy forest. Working with Friends of the Mississippi River, the Department of Natural Resources and other organizations, the Earth Club has been helping to return the site to a more natural state — a combination of native hardwood and floodplain forests — and having a great time in the process. “I like getting to know about plants, both invasive and native, where they came from and their names,” said Vue Pao Her, Earth Club participant. The “invasives” Her speaks of are primarily garlic mustard and common buckthorn, plants brought here by European settlers for gardening and landscaping. Unfortunately, they escaped people’s yards and spread into the forests and prairies, where they began to crowd out the native plants that birds, pollinators and other wildlife rely on for food. The club first began working with FMR at Indian Mounds Regional Park in 2012. The students helped plant and take care of a bluff-top prairie featuring grasses and flowers with deep roots that reduce erosion and help hold the bluff in place. Now well-established, the native prairie plants also provide much-needed food and shelter for birds, bees and butterflies. Building on their Indian Mounds success, in 2014 the club headed down the bluff to work on Willowbrook, a struggling riverfront forest owned by the Department of Natural Resources and located along Warner Road. Students began their Willowbrook restoration efforts by removing invasive species along a path and planting native seeds on the bare soil. Early the next season, they noticed that results were mixed. Was it the timing of their invasive removal efforts? Or perhaps when they planted the seeds? Or something else altogether? They decided to investigate. 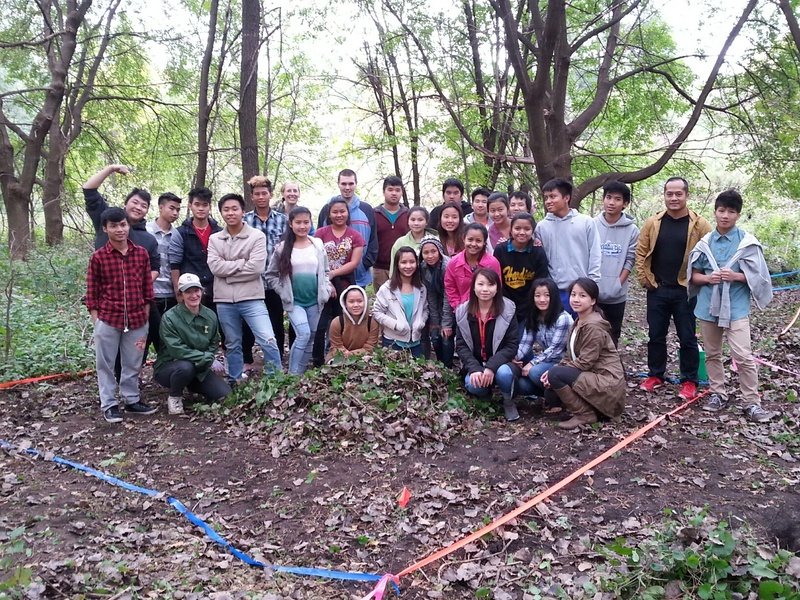 Harding High Earth Club members are researching invasive species removal and reseeding approaches in a St. Paul riverfront forest. Working with FMR Ecologist Alex Roth, FMR Youth Coordinator Kate Clayton, and DNR Regional Planner Gina Bonsignore the students developed a network of research plots in the forest, turning it into a living laboratory. In some areas they removed all the invasive species by hand in the spring, in another they waited until fall. Then they planted different mixes of seeds. While the project is still in its early stages, students have learned that one native species, in particular, does well across all of their test plots: wild rye. This native grass competes well with the invasive species, and grows in thick enough to keep them from coming back once removed. Roth said he’ll be sure to include more wild rye in seed mixes for the site, and that such information is highly valuable. While Roth may have a Ph. D. in ecology, but when it comes to Willowbrook and which plants will do well, he relies on Harding High Earth Club for direction. This spring the club returned to their Willowbrook plots, tallying up different plants and insects and removing even more garlic mustard. The club's seen a big difference in the number of invasive species in their work areas, and enjoy making — and documenting — the positive change on their local riverfront habitat. Although young, they enjoy transforming Willowbrook into a healthier riverfront forest, for not only wildlife but future generations to come. “I enjoy Earth Club and working with FMR because I get new experiences, and I get to help people and clean up the river. I want a better life for our children," said club member Chao Xiong. FMR is helping to protect and restore important natural areas and parks throughout the metro area. Check out our events calendar for upcoming volunteer and educational activites sign up for Mississippi Messages to receive twice monthly FMR calendars in your inbox. If you’re part of a school, church, or other community organization looking for a service outing or project, please contact Kate at kclayton@fmr.org or 651-222-2193 x23.